The paper based and computer based TOEFL have the following sections. During the TOEFL listening test, you have to listen to people speaking. A monitor will show their photos and some other information. The listening test has two parts: A and B. In part A, you will hear dialogues between two people. After each dialogue, you are required to answer a question. You will be given 4 answer choices from which you have to choose the most appropriate. In part B, you will hear longer dialogues. Like in Part A, each dialogue in Part B is followed by a question. The English you will hear in the listening section is modern American English. Familiarity with the American accent is extremely essential to score well in the listening test. Try to answer quickly. Keep in mind that you cannot skip questions and go back. There are two types of questions in the structure and written expression test. Type 1 questions have gaps in them. Each question is followed by four answer choices one of which can be used to fill the gap. Type 2 questions have an error them. Each question has 4 marked parts one of which contains the error. Your task is to identify the part that contains the error. Note that you don’t have to correct the error; you just need to mark it. 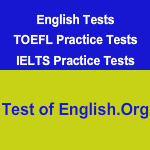 The reading comprehension tests in the paper based and the computer based TOEFL are the same. Read the text carefully and start answering. You can skip a question and then go back to it. Start with the easiest questions. Don’t leave questions unanswered. You need good practice to do well in this section. Practice writing essays at home. Note that you will have to write your essay in half an hour. You will have to agree or disagree with the given statements. Support your arguments with facts. Note that the paper based TOEFL does not have a writing section.